In 2011 and 2012, while studying the region around Pluto with the Hubble Space Telescope, I discovered the dwarf planet’s fourth and fifth known moons. Like all new astronomical objects, they started out with rather prosaic names — “S/2011 (134340) 1” and “S/2012 (134340) 1”, or, for short, P4 and P5. I soon found my inbox stuffed with hundreds of naming suggestions. With so much interest, it didn’t seem fair to leave the job to just a handful of scientists. 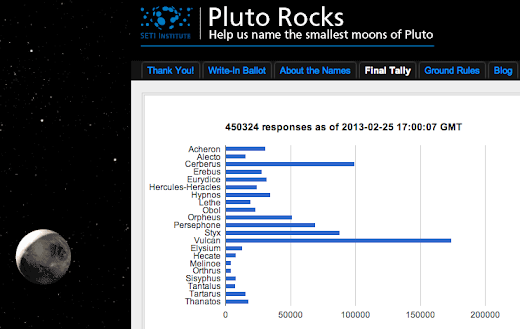 Instead, we decided to let the public propose and vote on the names of Pluto’s moons. We knew that the web servers at the SETI Institute, my research home, could never handle the bandwidth required for such a task. However, the Institute has built strong relationships with Google through our extensive use of G+, and our friends there were thrilled to let us use Google services for the demanding task. I asked my husband Frank Yellin, who works on the Gmail team, for help in setting up the forms and collecting the data. Google Forms and Google Sheets were obvious choices, but with the volume of contributions and votes we were expecting, we knew we’d need programmatic help checking for duplicate nominees, filtering out inappropriate names, and tallying the votes. With some help from his colleagues (“How do I split a string?” “How do I make a hash table?”), he turned the project around in a few hours. Processing that had taken tens of minutes using Java took mere seconds in Apps Script, since nothing but the results ever had to leave the data center. We were right to be prepared. By the time we closed the write-in ballot, we had received 30,000 write-in nominees and more than 450,000 votes. We are now using the results of the poll to support our proposal for the formal names of P4 and P5. That decision is currently in the hands of the International Astronomical Union. When the final decision is made, Pluto and Charon and Nix and Hydra will be joined by two more representatives of the ancient underworld. Planetary scientist Mark Showalter is a Senior Research Scientist at the SETI Institute. His primary interest in the dynamics of planetary rings. To date, this interest has led him to discover five new moons and three new rings.